Hamilton student is Wisconsin's Microsoft Word champion - Hamilton School District. 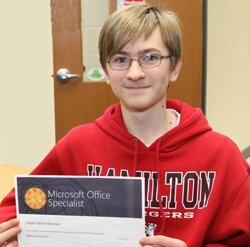 Hamilton High School sophomore Logan Mumper is the Wisconsin state champion in the Microsoft Office Specialist (MOS) Word 2016 exam. Mumper will go on to compete June 13-15 at the 2018 MOS U.S. National Championship in Atlanta. A student in Toni Hillmann’s Computer Application class, Mumper was among other classmates who take industry-standard tests after each unit that includes Word, Excel and PowerPoint. In all, 34 Hamilton students have been MOS certified, demonstrating specialized competence in Word 2016. Certification provides industry-leading assessments of skills and knowledge, giving students real-world exercises to appraise their understanding of Microsoft Office. This is only the second year that Hamilton has participated in Microsoft Imagine Academy, a nationwide program that allows schools to offer fundamental technology skills training and rigorous technical courses for students who are interested in pursuing a career in information technology after graduation. Microsoft initially provided a grant that allowed Hamilton to participate in the program.